Mogadsihu (HAN) May 18, 2014. Humanitarian News. The Somali civilians of Bakool region of Southern Somalia are likely to face severe food shortages in the coming days and weeks if markets remain blocked by border and road closures, and humanitarian access remains limited, warn food security agencies. The Al-Shabaab Militants have been denying humanitarian agencies and commercial commodities access to the city since then. “Should the situation last, food security is foreseen to worsen severely in the coming days,” says Abdullahi Mohammad, Geeska Afrika Online’s regional security and safety reporter based in Mogadishu, . The border with Ethiopia is officially closed as a result of the conflict that broke out between Somali national Army (SNA) with the support of Ethiopian forces and the Al-shabaab Islamist militant groups that were occupying the outskirts of Bakool. As a result, the amount of food coming through Bakool has halved, according to the UN agencies, Vulnerability will increase and the threat of hit and run operations of Al-Shabaab will increase, unless AMISOM forces enforces its mandate. The Somali militants of Al-Shabab units are still enforcing a blockage; No commercial goods or humanitarian assistance are allowed to reach the city of Hudur, the provincial capital of the south-western region of Bakool. The city was previously controlled by Al Shabab militants, but it was seized by Somali National Army (SNA) backed by the Ethiopian forces, which are part of AMISOM mandate. 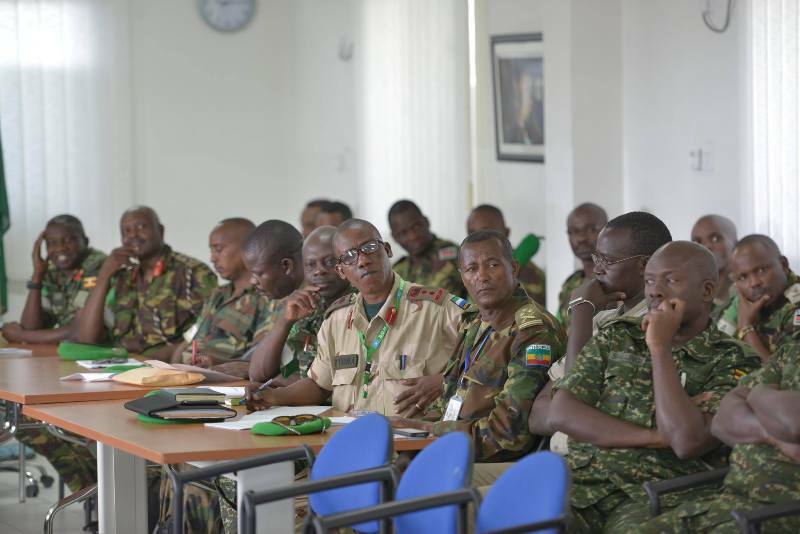 According to the Photo: AMISOM Force Commander Lt. Gen. Silas Ntigurirwa addresses sector commanders and partners in a meeting held in Mogadishu. The meeting discussed further operations and plans, as the Mission continues to work towards the liberation of Somalia from al Shabaab. Meanwhile: The Federal Government of Somalia is training administrators for the towns recovered in the recent military offensive by the Somali National Army (SNA) and the African Union Mission in Somalia (AMISOM). Regional administrators have been identified by the Ministry of Interior and Federalism for a two-week training course taking place in Mogadishu.